The tiny world of bees is a place where all kinds of magical things take place. Not only do they create honey, bee pollen and royal jelly not so ceremoniously called “bee spit” they also help maintain our ecosystems through pollination. Royal jelly is made to feed all of the bee larva in the hive and it is high in 3 major nutrients amino acids, vitamins and minerals. It also has been found to have various biological activities, such as an insulin-like action within the body and antioxidant properties. So why is this important? It is important because there are 29.1 million people with diabetes in the U.S. with 8.1 million of these being undiagnosed and royal jelly has been found to help control it! How does it do this you ask? Well let’s first look at the type of diabetes, type 2, which benefits from royal jelly. Type-2 diabetes is when the body is still producing inulin (the hormone that controls blood sugar levels) but the cells in the body have developed a resistance to it. This is similar to the resistance bacteria have to antibiotics when they are over prescribed. This insulin resistance ultimately means that the body’s blood sugar continues to rise faster than the body can use it or store it and chronic hyperglycemia (high blood sugar) ensues. Hyperglycemia when left untreated leads to increased oxidative stress resulting in heart disease, kidney failure and hardening of the arteries. But don’t fret because recent studies have found in the tiny world of bees that their royal jelly’s insulin-like peptide activity and antioxidant properties help reduce insulin resistance and oxidative stress caused by hyperglycemia. In one study 50 female volunteers with type-2 diabetes were given a 1,000mg soft gel of royal jelly daily for 8 weeks. 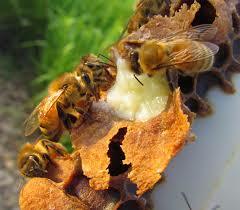 Compared to the placebo group the blood glucose levels had decreased remarkably in those taking the royal jelly. In another study conducted over 16 weeks with 50 women it was seen to reduce oxidative stress, decrease blood glucose levels and increased insulin levels in the blood extending the average life span by about 25% compared to the control group. So if you have just been diagnosed with type-2 diabetes and you’ve already changed your diet and started exercising more why not throw royal jelly into the mix! Samira Pourmoradian, Reza Mahdavi, Majid Mobasseri, Elnaz Faramarzi, and Mehrnoosh Mobasseri. Effects of Royal Jelly Supplementation on Glycemic Control and Oxidative Stress factors in Type 2 Diabetic Female: A randomized Clinical Trial. Chinese Journal of Integral Medicine. 2014, May; 20(5). 347-352.